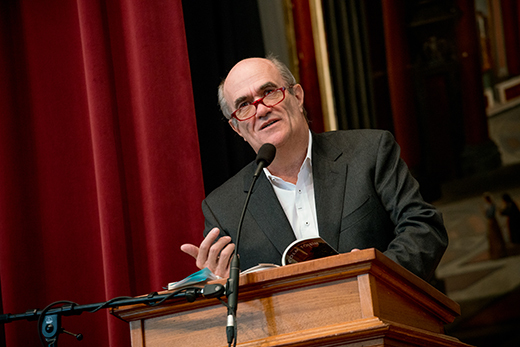 Award-winning Irish writer Colm Tóibín will deliver the next series of the Richard Ellmann Lectures in Modern Literature at Emory University Nov. 12-14, 2017. Tóibín has been recognized internationally as a versatile novelist, short story writer, playwright, poet and screenwriter. The film adaptation of his sixth novel, “Brooklyn” (2009), about a young Irish immigrant, earned three Academy Award nominations in 2015 (Best Picture, Best Adapted Screenplay, Best Actress). His 10th work of fiction, “Nora Webster” (2014), a novel of widowhood, grief and endurance in a small Irish town, won the Hawthornden Prize, one of the most prestigious awards for fiction. He recently co-wrote with Volker Schlondorff the screenplay for the German film “Return to Montauk,” to be released in May and selected to compete for the Golden Bear award at the Berlin International Film Festival. “Tóibín will step out of his own creative writing to explore the influential role of literary fathers Sir William Wilde, John Butler Yeats and John Stanislaus Joyce on the life and works of their great sons,” says Ron Schuchard, professor of English emeritus and co-director of the Ellmann Lectures with Geraldine Higgins, associate professor of English and director of Emory’s Irish Studies Program. “Toibin reflects the grand Ellmann tradition of being able to lecture on serious literature to a general audience in beautiful language, with much sparkle, humor and wit, and with an extraordinary ability to re-vivify artistic sensibilities and literary histories for his audience,” says Schuchard. The Ellmann Lectures, established in honor of the literary criticism of Emory’s first Woodruff Professor, and inaugurated by the late Seamus Heaney, who delivered the lectures in 1988, have become one of America’s most prestigious literary lecture series. They have brought to Emory a distinguished sequence of international authors, including David Lodge, A. S. Byatt, Salman Rushdie, Mario Vargas Llosa, Umberto Eco, Margaret Atwood and Paul Simon. The Ellmann Lectures are ticketed but free and open to the public. Tickets will be available near the beginning of the university’s fall semester.